A good email marketing strategy arrives in many forms. From the simplistic, single message announcement through to strategic eNewsletters providing interesting and relevant industry messages to its targeted audience. Over the years, the rise and rise of the spam email and subsequent spam filters has led marketers to up their game in order to get their own message through to the recipient and for this to be opened, read, understood and acted upon. The name of the game is email marketing strategy that creates credibility. And through credibility comes trust, awareness and consumer loyalty. Of course, whereas a typical eShot may look for a direct purchase for goods or services, a strategic eNewsletter looks to build up consumer confidence first and a ‘buy in’ to that company’s values. An eNewsletter, if done correctly need not bombard the recipient with requests to buy their product. Instead, it is a much more laid back ‘sales technique’. After all, as we all know, customer loyalty is earned not bought. arvato are the experts in Loyalty Marketing, delivering rewarding experiences to tens of millions of their clients’ customers in 65 countries. With clients such as Renault, BUPA, Virgin Holidays, Sony, Microsoft to name but a few, they know more than most about establishing and growing partnerships through loyalty. So much so, that they have recently established clubarvato – a network group for Loyalty Leaders. When clubarvato decided they wanted to maintain loyalty with their own members, email marketing was firmly in the marketing mix. A strong email marketing strategy was required and arvato turned to their digital agency, Design Inc for support. The following are six general tips we gave them for a successful email marketing strategy. When developing an eNewsletter, it is crucial to make it relevant and interesting to the audience. Ask yourself, what is in it for the reader. If the eNewsletter is full of stories about your own company staff (“they got married”, “he did a bike ride”, “she has left”), it is likely the content means a lot to you but little to the recipient. This is a turn off and a sure fire way to click ‘delete’ now and request ‘unsubscribe’ for the future. There is nothing wrong with having company information in an eNewsletter so long as it is relevant, for example if you have added new functionality that may benefit your clients to land a new customer. That said, a strategic eNewsletter design should also include industry news, links through to useful resources & information to help your clients grow their own business. arvato solution: Design inc recognised that as a networking group it was inevitable that the club arvato eNewsletter should feature articles relating to all aspects of the industry, including articles about the members as well as themselves. 2. What (not who) is your Competition? We are not talking about your company’s business competition. We’re talking about the competition for your eyes’ attention on the eNewsletter page. In addition, consider the competition in your recipients’ inbox. Ask yourself why would your recipients bother to read your eNewsletter first? Why would they read it at all? What is important is to make this relevant to them. A professional, good-on-the-eye design with a relevant subject line is key to grabbing attention. 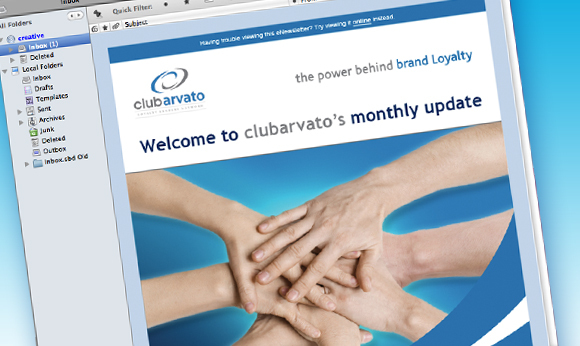 arvato solution: The club arvato eNewsletter design was formulated to fit in with their existing corporate brand style. It is eye-catching yet easy to navigate. With regards the email subject line, this has been kept simple, straightforward and obvious. The recipient quickly knows whom it is from and what it is about. 3. Who Are You Anyway? Over the years we have seen many eNewsletter designs which do not easily show who it is from let alone what message they are trying to say. The personality of an eshot or eNewsletter design should be clear. Understanding that most recipients split their email screen leads to ensuring the eNewsletter is designed to be recognisable at its header. This is email window shopping. We would always suggest the company logo & corporate theme should feature in the header, preferably with the strapline message. The eNewsletter should advertise itself even before it is clicked on. Email users are very discerning and can spot something they don’t recognise within a fraction of a second. arvato solution: Design Inc were adamant the e-newsletter be designed with a simple yet corporate header in mind, ensuring the company logo and name were available right at the top. Now, clearly visible in a split screen the arvato e-newsletter is recognisable from the moment it appears in the inbox. If you go to the trouble (and time & cost) to send out an eNewsletter, make sure you have enough to say. Too few articles and the recipient will be left hungry. This is an eNewsletter after all. Of course, it is important not too overfeed the reader with too many long articles either. If you do have a lot of articles, reduce the text accordingly and include links to other online locations where the full article can be read. arvato solution: In the case of the club arvato eNewsletter design. Design Inc have suggested a maximum of 12 articles each time and have ensure all articles are linked to more available information either on the arvato website or elsewhere. arvato solution: Design Inc helped arvato to build their own data. Every email address was qualified either as an existing member or a qualified potential lead and a consent process was undertaken. Now when arvato send out an eNewsletter, they know it will be well received. So, you’ve gone to the time, expense and trouble to have an eNewsletter created. The design style is perfect, the articles are relevant and the data list is strong. Then you send it out. Now what? Wouldn’t it be useful to know which recipient read your newsletter or, better still, which article they were particularly interested in? With this information, you can support them with providing more relevant information. Furthermore, knowing who read the newsletter versus who didn’t bother can help narrow your marketing into focusing on those who are interested and not wasting valuable resources on those for whom the eNewsletter or eShot is not relevant. Who opened (read) the eShot? Which articles they clicked through to? Who clicked on the link? arvato can even see which of the email addresses in their list are no longer working, leading them to update their data immediately. The clubarvato email marketing strategy has been a runaway success. this has led to a high percentage readership, no ‘unsubscribes’ to date and new members joining after each message, building stronger relationships and continuing consumer loyalty.